Delicia Silva aka Cigar Vixen has taken us on an exciting journey by traveling to the hottest Nicaraguan spots like The Emerald Coast or Granada. In her final episode she culminates the series with a visit to the historic (and hot!) city of Leon one of the few places in the world where you can practice volcano boarding. Are you ready? Delicia begins her Leon adventure by exploring the most cultural sites of Leon: The Leon Cathedral World Heritage site by UNESCO and its surroundings like the busy ‘El Sesteo’ one of the go-to restaurants in Leon right outside the Cathedral sought after for its primer location and because it offers one of the best views of the city. She then moves on to visit the house were Ruben Dario, the father of modernism spent the first 14 years of his life. The first poem he wrote along with other manuscripts and personal items like his bible, his bed, and some of his clothing, are here on display. Lastly, she has dinner at ‘El Convento’ a staple Leon Hotel known for its beautiful gardens. In order to practice sandboarding, you first need to climb the volcano while carrying your board. The hike itself is 2388 ft. and can last for about 45 minutes. Delicia climbed up the volcano, took in the view, smoked a good old Antano 1970, and then made the whole trip worth it by sliding off the volcano in one what can easily be the funnest few minutes of her life. Sadly, all good things must come to an end eventually. 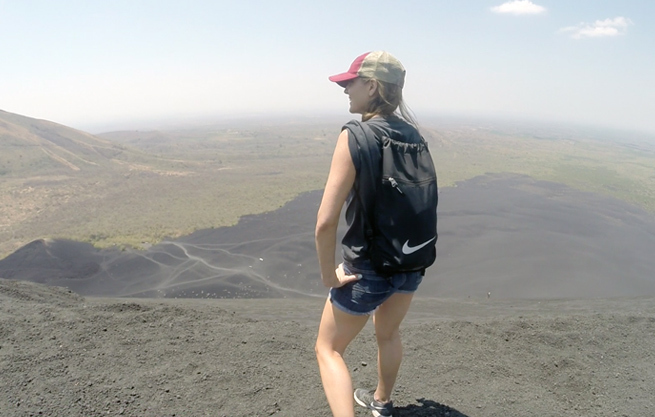 For now, Delicia’s time in Leon marks the end of her travel series about Nicaragua. We hope you enjoyed discovering Nicaragua through Delicia’s eyes, because as she mentioned earlier, Nicaragua has a lot more to offer than just one of the best cigars in the world.